Congratulations to M. Mason who placed the winning bid of $1,000 for Augusts's silent auction painting "Windy Day", by Aleksander P. Sukhov,, estimated at $3,500- $4,500. As our October silent auction selection, we are pleased to present a beautiful fall landscape, "Vilaage Salpa" by Vladimir V. Filippov estimated at $3,500 to $4,500. Vladimir is one of Russia's most talented up-and-coming artists, and one of the Gallery's favorite painters. He has grown to be one of the most honored landscape artists painting in Russia today. Filippov was trained, and lives in the renowned Russian art village "Akademicheskaya Dacha" or Academic Dacha, halfway between Moscow and St Petersburg. For more than 130 years, this village has been almost a sacred place to Russian artists. Filippov was introduced to the McCarthey Gallery by the master painter Yuri Kugach (recently deceased at age 97) who was named as one of the top 10 artists of Russia in the twentieth century. Under this tutelage, Filippov has become a respected and sought after Russian artist. Filippov captures the native Russian countryside with a vivid intimacy attesting to a love of life spent close to the land. The contrasts and vividness of colors combined with Filippov's masterful use of shadows in "Village Salpa", shows Filippov's impressive skills and natural talent. 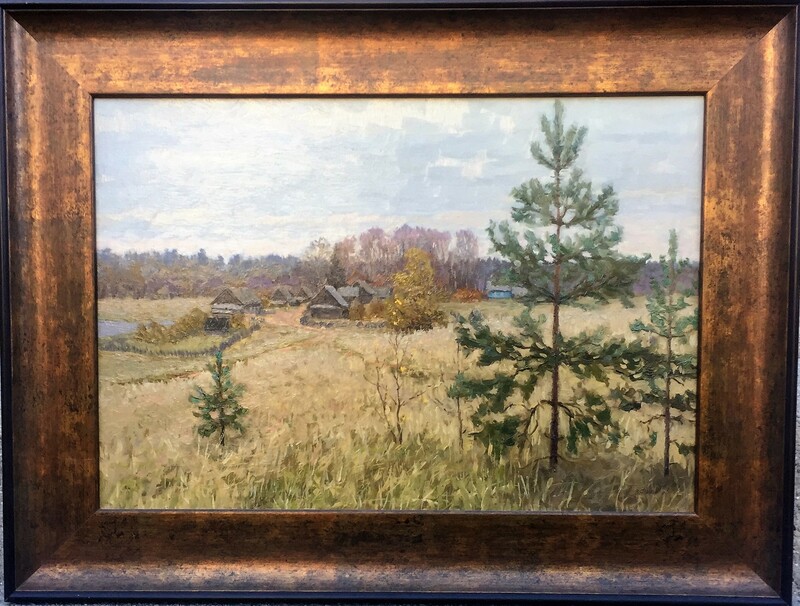 This work is a beautiful representation of the Russian country side and shows the wonder and beauty of fall which Filippov so masterfully captures. This painting would make a stunning addition to any collection or a great painting to start your collection. 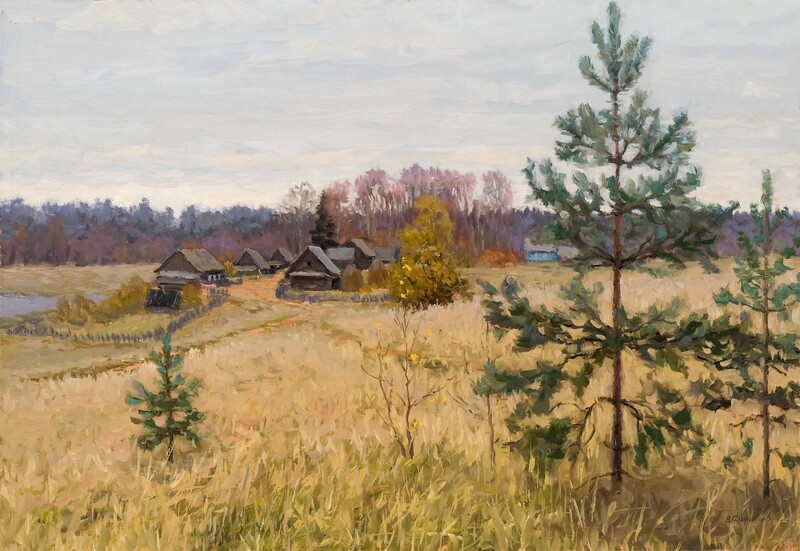 Vladimir V. Filippov, "Village Salpa"
Estimated at $3,500 to $4,500, the current high bid is just $2,000! The next bid is $2,250, followed by minimum bidding increments of $250. Remember, there is no reserve, at the end of the auction the high bid wins! Bids will be taken via telephone, or e-mail until 7:00 pm MST, Wednesday, October 31st. Follow all the bidding updates on the Gallery's website. Russia has a long tradition of the great master painters giving apprenticeship to the best of the next generation thereby keeping the venerated Russian tradition of realism alive. That is the case between the legendary Russian master painter Yuri Petrovich Kugach and his student, Vladimir Viktorovich Filippov. They lived and worked in the legendary artistic community of Academic Dacha. Even today, in this idyllic setting, many great artists still call Academic Dacha home. The place has been the residence of Yuri Petrovich Kugach (who recently passed at the age of 97) since 1951. Over the years, Yuri Petrovich was a generous mentor to several promising artists. Kugach, who was named one of 'Russia's top twenty artists of the twenty first century', introduced us to one of his students in 2011, Vladimir Filippov. Yuri Petrovich told us that Vladimir was his finest student ever. Kugach told us that Filippov's soul was imbued with Russia's nature. He said that "while you can teach technique, color and composition---an artist's ability to 'feel' the land is unteachable." Kugach said that the instinct of greatness is genetic and that Filippov has that very rare natural talent. 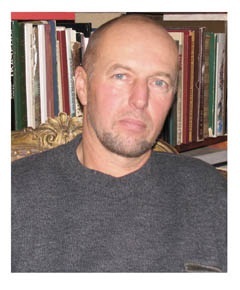 Vladimir V. Filippov was born in 1956 in Vyshniy Volochek. He spent his childhood in Novoye Kotchische Village, where such famous artists as brothers Sergei & Aleksei Tkachev lived. It was also not far from the Academic Dacha named after the great painter Ilya E. Repin. The Academic Dacha is a well-known Art Academy and artist community in Russia, and that creative atmosphere had a great influence on young Vladimir's creative future. Filippov spent long hours visiting artists in their studios, and admiring great artists and their paintings. Since childhood Vladimir's dream was to become a great artist. But at the beginning, Vladimir's way of life was sidetracked from art. Having graduated from the Railway Collage, he enrolled in the Soviet Army. After his demobilization, he entered the Agricultural Academy. However, he never abandoned his dream to become an artist. Vladimir painted his first water-colored still life from nature in the studio of Nikolai A. Sysoev, who was an honored artist of the Soviet Union. He painted with great vigor under Sysoev's direction. Later on in 1970, he became acquainted with Peter I. Strakhov and Peter's wife Lia A. Ostrovaya, who were famous artists in Leningrad (St. Petersburg). Peter Straknov made great contributions and progress in Vladimir's creative development. Since 1970, Vladimir Filippov has devoted his life to painting full time. He has been an enduring participant of all the local and regional exhibitions since 1980. Since 1990, Filippov has trained and worked under the Russian Realist masters Yuri P. Kugach (senior) and his son Mikhail Y. Kugach, who is now head of the Kugach Studio and a full member of the Russian Academy of Arts. Also, Vladimir has painted in the company of such wonderful artists as Grigory Chainikov and Andrei Zakharov. These artists and close friends have played an important role in Vladimir's development as an artist. Filippov is one of the few artists continuing the great tradition of Russian Realistic Art. Vladimir Filippov has been a member of the Union of Russian Artists since 2003. His paintings are exhibited in the Museums of Mogilev and Bobruisk (Republic of Byelorussia), in the Museum of Harbin (China), in many private art collections in Russia, Czech Republic, Yugoslavia, Romania, Finland, Germany, China, and the USA. Filippov works with the Moskvorechie Creative Association.